The first churches in The Netherlands were mostly built of wood and were often constructed on the location of former pagan temples from the Roman period. Of these churches nothing remains today. The oldest surviving churches all date from the 11th century, although older fragments have been preserved in several churches. The oldest type of church is that of the simple rectangular space with a ditto choir. This type of church is preserved in the old church of Lemiers (L). The style is often called Carolingian, but it is better to speak of early-Romanesque. Thick walls, small windows and round arches and apses are some of the major characteristics of the Romanesque style. The name Romanesque, which is far more recent than the style itself, suggests a continuing of Roman building techniques. This seems to be a fact, although there was a decrease of knowledge after the fall of the Roman empire, like the method of making bricks. Charlemagne reintroduced many techniques preserved in the northern part of Italy to the rest of his empire. Two basic Roman shapes of buildings were used for religious buildings; the basilica and the centralized building. 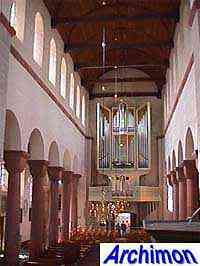 An example of the latter is the St. Nicolaaskapel in Nijmegen (G), which in several ways is a scaled down copy of Charlemagne's chapel in Aachen, Germany. By the time it was built the Carolingian empire had ceased to exist. Most of the current Netherlands had become part of the German empire, and was divided over the two dioceses of Utrecht and Liège. Romanesque was a style with limits. Gothic allowed for much higher buildings, with much larger windows being possible than before. It was only logical that many Romanesque churches were either partly or completely replaced by Gothic structures. Others followed later. In large parts of the country little to nothing is left in a more or less complete form. Much of what remains are simple village churches which in most cases can hardly be filed under any category. Of other churches only the tower has survived. Only the relatively few surviving bigger Romanesque churches, often founded by bishops, give us some idea of the various different styles in the Netherlands. The following categories are usually mentioned in the literature. For lack of good English terms, improvised translations are used. 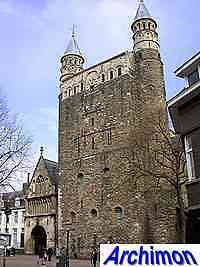 The Utrecht group contains several early-Romanesque churches, the most important of which are no longer there. What remains are a few much altered churches that however are still recognizable as originally Romanesque churches, thanks to several important well-preserved parts. Part of this category is the Bernulfus- or Bernoldus-group, after the bishop that was its instigator. All these churches were built shortly after 1040. The St. Pieter in Utrecht (U) (left) is regarded as the best preserved church of this group. With four other churches it formed a cross of churches in this city, with the cathedral in the centre. Of these five the St. Jan is the only other survivor. 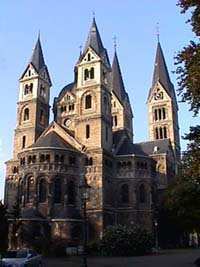 The St. Lebuïnus in Deventer (Ov) and the St. Martinus in Emmerich (Germany) also belonged to this group. 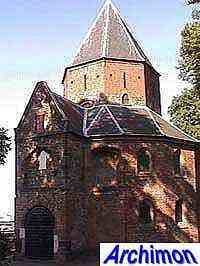 The St. Plechelmus in Oldenzaal (Ov) dates from the 12th century but is often ranked under Utrecht Romanesque as well. 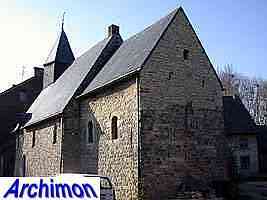 For a long time it has been assumed that the territory of the Liège diocese had its own style of Romanesque. Although many attributes of this style are found inside this territory, which includes large parts of Belgium besides the southern part of the province of Limburg, there are too many exceptions to speak of a true regional style. 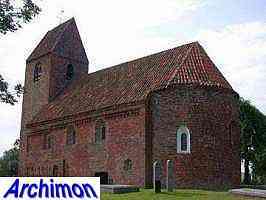 However, the Romanesque churches of this area are different in many ways from those in other parts of the country which belonged to the diocese of Utrecht. They are mostly built out of natural stone. Larger churches have a westwork, an almost fortress-like tower, inside of which is a choir. The Church of Our Lady in Maastricht (L) shows a westwork of the earliest type (left). This type consists of a massive looking tower flanked by either round or square stair-turrets. The St. Servaas in the same city was the first example of a more artistically refined type. This type has a more decorated lower tower-segment. Another characteristic found in this area is transepts that are lower than the nave, as also see on Maastricht's Church of Our Lady and the churches of Rolduc. Other churches belonging to this group are those of Susteren and St. Odiliënberg, although the latter is essentially a post-war reconstruction. Besides in parts of Germany, the late-Romanesque style of the Lower Rhine is also found in Limburg, where it partly replaced the previous Mosan style. Typical for this style are the cloverleaf-shaped eastern parts of the church, with semi-circular or polygonal apses with dwarfgalleries. The choir of the St. Servaas in Maastricht probably was the prototype for this type of apse, but the Minster in Roermond (left) is the only church in the Netherlands with a completely surviving eastern part in this style. Furthermore, Romanesque is often combined with elements of Gothicism, reason why this style is often called Romano-Gothic. Unlike the other groups, the North-Eastern category mostly consists of smaller village-churches, as most of the bigger churches of the group have been replaced or rebuilt. Churches of this group are found in the provinces of Friesland, Groningen and Drenthe, with a few examples in Overijssel as well. Typical for this group is the tower with saddle-roof, an attribute that continued to be used in this region for Gothic churches later, and the semi-circular choir that in many cases has been replaced. Some churches originally had a rectangular choir though. The picture shows the church of Marsum (Gr). In this region Romano-Gothic gradually replaced Romanesque before further developing into Gothicism. Because there are few complete survivors many other Romanesque churches cannot be filed under any of the above categories. There are however many churches left in which the Romanesque origins are clearly recognizable.